Invoicing Software makes it easy to manage sales, create invoices, receive and keep track of payments, do your business accounting and calculate taxes. Our innovative invoicing system enables you to invoice clients fast - receive and track payments online. Use built-in powerful features to manage recurring invoices and payments. Combine this with easy transitions from estimates and quotes to active invoices and you will discover how it will help you to develop your business . Invoices are a section of your outgoing communication, and Invoice will assist you to make them look professional. Upload your logo and any different photographs you like to use; the templates are utterly customizable and enable for full manage over the layout.When it comes to growing an invoice, just take a look at the billable work and costs you desire to include,and your first draft is ready. Invoice calculates everything for you: subtotals, income taxes and cent rounding. We assist you track every billable hour and make sure each minute counts. Whether you juggle multiple projects a day or work on a single long-term contract, our timesheets let you track worked hours in an intuitive way that fits your work style. Lancelog supports both detailed, daily and weekly time reporting, and lets you access timesheets from anywhere and at any time with a simple web browser in a secure way. Always make sure you keep track of how lots you spend, and on what. 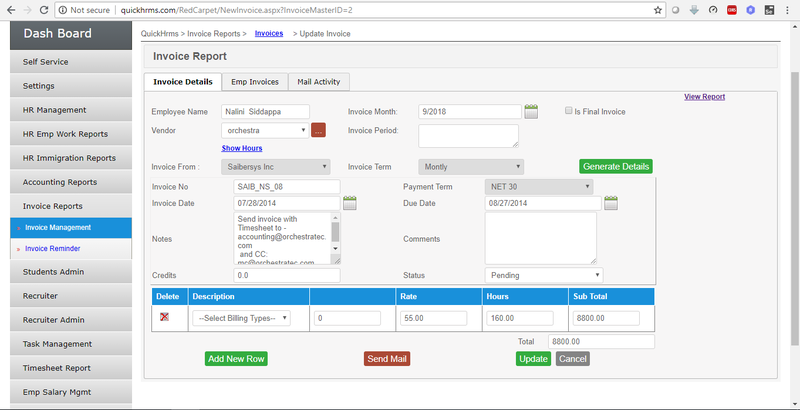 Invoice is aware of which expenses are unbilled and which have been recouped. Assign charges to categories and providers and get immediate feedback on the place your money goes. Expenses assigned to customers are without problems introduced to your invoices, entire with currency conversions and the capability to set an arbitrary client price.